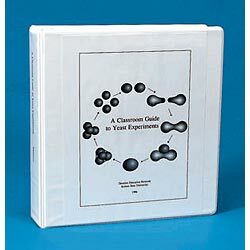 Provide your students with hands-on learning of basic genetic concepts. This text presents Saccharomyces cerevisiae (baker’s yeast) as a model organism for teaching the basics or for independent student research. It gives technical and background information at a variety of levels to accommodate different objectives and user experience. An introductory section offers basic information about the Saccharomyces cerevisiae life cycle, genetics, metabolism, and response to UV irradiation. Later sections offer more in-depth information about understanding, analyzing, and setting up certain experiments; a glossary; and a reference section covering basic laboratory techniques. Experiments include a basic cross, a dihybrid cross, complementation, mitotic segregation, meiosis, the effects of nutrient availability and ultraviolet radiation on the organism, and more.